I have a culinary crush on Thomas Keller, and in poking around on the website for Seattle’s cookbook store, I discover they have a signed copy of one of his cookbooks for sale. This seems like a good reason to leave the house during our Christmas vacation, so The Child and I abandon our new toys – briefly – and head in to the city. It turns out the store doesn’t have the book I think they do – Ad Hoc at Home , in case you were wondering – but they have dozens of other signed cookbooks that they are happy to sell me. I immediately spy a signed copy of Alice Waters’ newest, which I leaf through and claim, since it has a number of vegetarian recipes, although, truthfully, I’m not sure how many of them I’d actually make. I keep looking. There’s plenty to look at – all the big names are represented, many with signed copies – Ottolenghi! David Tanis! But it’s like being lost in paradise: Everything around me is wonderful, but I just want Home – the cookbook full of things I’d actually make and eat. Most of the books have one or two recipes like that, but that’s it, and those are the books I check out of the library. The Child is bored. You found something, she says. Can we be done? No, I tell her. Not until you find a cookbook full of recipes you would eat. Go find it. She comes back five minutes later with her mission accomplished and a very pleased expression. Can we get it? It will be my first cookbook. Can I get it? She’s found a tiny cookbook, beautifully and probably artisanally printed, with nothing but different recipes for strawberries. I can’t argue the point – she really would eat pretty much anything involving strawberries. I tell her it’s hers if she lets me find a cookbook too. I want something full of recipes we both want to eat. She takes my Alice Waters and turns her nose up at it, and then does the same with Patricia Wells. I hand her a book full of Mac and Cheese recipes, but she pronounces them weird and points out that half of them involve meat. I finally pick up and start leafing through what I think is a baking book, Flour, Too , by Joanne Chang. I loved her first cookbook, which actually was a baking book, that I checked out of the library to try, and then made several superb recipes from (Classic Peanut Butter Cookies and Vanilla Bean Krispy Rice Treats). This new book, though, includes both sweet and savory dishes, and I sit down with it and start putting mental sticky notes on half the pages. Chili and soup and sandwiches that even The Child might eat. I hand it to her, and she doesn’t need to do more than look at the table of contents. Spiced Banana Pancakes? We’re getting it, she says. The first recipe I tried was the first dinner recipe that The Child got really excited about – Three-Bean and Corn Chili. She misses chili, she tells me, and I kind of agree. It seems like an obvious thing to make for her, because she loves it and there are hundreds of recipes for vegetarian chili out there, probably thousands. Yet, I’ve never found one I liked, until now. Chang’s recipe, like all her other recipes I’ve tried, isn’t complex. Although she gives directions for an overnight bean soak, she very graciously also gives directions for the rest of us – the ones who didn’t plan our meal yesterday but really want chili right now. I made this with canned beans and it was just fine. I also didn’t use no-salt-added tomatoes, but took extra care at the end not to oversalt, tasting rather than measuring out salt. I cut all the pieces into a fairly small, even dice, and cooking was a breeze. 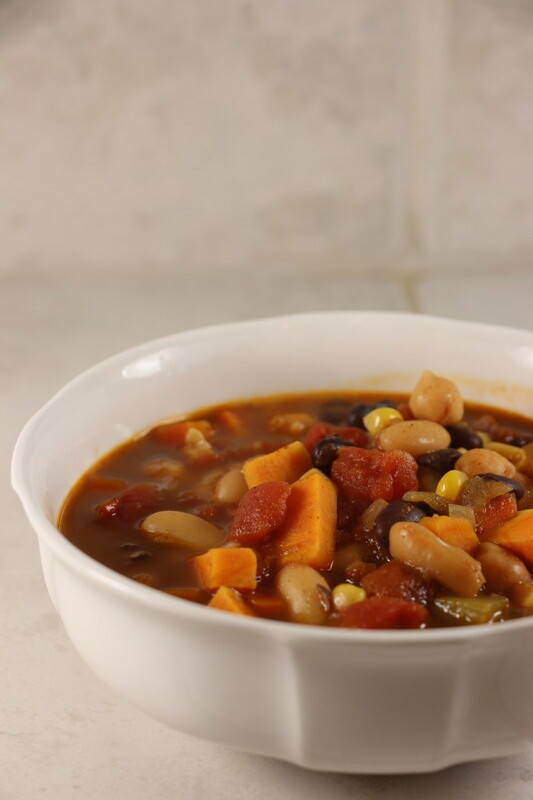 It doesn’t have the issues that I’ve found with other vegetarian chili recipes that I’ve tried – too watery, not robust enough, not enough flavor. A lot of them feel more like soup to me than chili. This chili is spicy, and those who don’t like things very spicy may wish to cut back on the amount of chili powder used (one blogger suggests cutting it by half). I thought it was fine, but The Child thought it needed to be less spicy. Still, she surprised me by proclaiming that she liked it, and asking if I would make it again, just with a little less spice. I will definitely make it again, and play around with it until I get the spice mix just right for her – once I finish this batch. It makes a lot. Drain the beans in a colander, rinse under running water, and set aside. In a large stockpot, heat the vegetable oil over medium heat. Add the onion, carrot, celery, sweet potato, and garlic, and cook, stirring occasionally, over medium heat for 6 to 8 minutes, or until the vegetables start to soften, the onion starts to turn translucent, and you can smell the vegetables cooking. Add the drained beans, corn, green chiles, tomatoes, and 4 cups of water, and bring to a simmer over medium-high heat. Add the vinegar, brown sugar, chili powder, paprika, cocoa powder, cayenne, salt, and white pepper. Stir until well mixed and bring back to a simmer. Reduce the heat to medium-low and simmer for 20 to 30 minutes, or until the mixture thickens a bit. The chili can be ladled into bowls and served immediately, or it can be cooled, covered, and refrigerated overnight to develop flavor and texture. It can also be stored in an airtight container in the fridge for up to 3 days or in the freezer for up 1 month. Chang also gives instructions for using dried beans in her book. I used canned beans for convenience and the recipe worked very well. I also didn't use "no salt added tomatoes", but you should adjust the amount of salt you add at the end if you do this.